One more wondeful natural attraction is owned by China, Huangguoshu Waterfall. Also known as Yellow Fruit Tree Waterfall, is the largest waterfall in China and East Asia, located in Baihe River in Anshun, Guizhou Province. 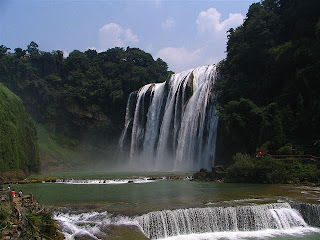 Huangguoshu Waterfall has a height of 77.8 meters and a width of 101 meters to the main waterfall has a width of 67 meters and 83.3 meters high. Not imagine how the grandeur of this waterfall. When in any area attractions, you can find a water curtain cave named "Shuiliandong" which can be found behind the waterfall. This allows visitors to not only see but also hear and touch the waterfall. 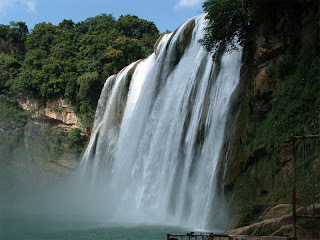 To enjoy its beauty, you can see Huangguoshu Falls from several points of view. First through Guan Pu Ting, where you can see the whole panorama of waterfalls. And then, Wang shui Ting from here you can see a huge wave of water. The third is that of Wang shui Ting next to the Swimming Rhino. enjoy the beauty of the waterfall at night is also not overlooked, this is amazing. Huangguoshu Waterfall is one of several waterfalls in the world that can be seen from the top, bottom, front, rear, left and right.